The battle against cancer in humans is as old as mankind itself. Since veterinary medicine became a fully-fledged discipline in the previous century, this battle has been extended to animals, and more so than any other area of veterinary medicine, to our pets. Many animal owners who are confronted with cancer in their pet for the first time, are somewhat surprised to find out that cancer is as prevalent in animals as it is in humans. Once they have overcome the initial shock, they find it even more surprising that cancer in animals is treated very much the same way in animals as in humans. As vets we often get asked if there is a higher incidence of cancer in animals than in the past. The answer is difficult to verify 100% because extensive studies need to be done to confirm such a suspicion. However two reasons why there is a heightened awareness of cancer, and why it may seem like cancer has become more prevalent, is because animals have grown older in recent decades than in the past. This is because of advancements in modern veterinary medicine, preventative medicine like vaccinating and parasite control, high-quality nutrition, as well as being protected against predators, disease and other external influences. Our domestic pets live a very protected life in our modern homes where they cannot get out and fight with other animals or get run over by motor vehicles. The other reason is because modern veterinary medicine has given us the tools to become better at diagnosing and treating cancer at an early stage. A century ago we did not have the diagnostic tools we have today, which can clearly identify all different types of cancer and determine how invasive or extensive they are at the time of making the diagnosis. Depending on the type of cancer, the treatment modalities for cancer include surgery, chemotherapy (using medicines to fight the cancer), radiation therapy (using X-rays to treat the cancer) and alternative remedies. The treatment modality chosen depends on a number of factors such as the type of cancer, where it is situated, how invasive it is, how far advanced it is, and what the cost of the treatment involves. In our next article we will look more into the treatment of a cancer. Cancer can either be very visible like a lump somewhere on, or inside the body, often referred to as a tumour (which is derived from the Latin word for swelling), or can be completely invisible such as cancers of the blood. Cancer can broadly be divided into “not so serious” or benign cancer and “serious” or malignant cancer. The differentiation depends largely on how invasive the cancer is and whether it has the ability to spread to the rest of the body and affect all the body’s systems and organs. A benign cancer is usually a cancer which grows locally, is well confined or encapsulated, can easily be removed and does not have the risk of spreading to other organs. An example of such a cancer is a lipoma, which is a cancer of fatty tissue, which can usually be surgically removed without the risk of spreading to the rest of the body. Another example is a benign adenoma, which is similar to a wart and usually appears as a small lump which grows on the skin, and which can be surgically removed without ever growing back. One thing to remember though is that even if a cancer is benign, it cannot be left without attending to it. Lipomas which are left to grow into huge tumours can become quite complex to remove surgically, and many times distort the blood supply to the area where it is growing significantly, making surgery more risky and complex. A benign adenoma which is left to grow can become a physical impairment and get damaged and bleed. Continuous irritation and damage may in certain cases lead to a benign tumour becoming aggressive or malignant. Malignant cancer may not necessarily form a big lumpy tumour, but may start as a small almost invisible spot. A good example of such a tumour is a malignant melanoma. This cancer usually starts as a small black spot and can either grow larger in the localised area where it occurs, or may stay small but start spreading to other organs. Once it has started spreading, it is virtually impossible to stop and invariable ends up with severe generalised cancer and death. The difficulty is that outwardly a benign adenoma growing on an animal with dark skin may look very similar to a melanoma on the same animal. It is therefore imperative that a proper diagnosis needs to be made by a properly qualified veterinarian whenever you notice any growth or discolouration which is abnormal. The location and appearance of the cancer. Certain cancers occur very typically in certain species or on certain parts of the body. A good example is squamous cell carcinoma on the tips of the ears or nose in white cats. When a vet sees a white cat where the tips of the ears or tip of the nose has an ulcerated or raw appearance which the owner says has been coming on over a period of time, the chances are 99% that it is a squamous cell carcinoma which is a malignant locally invasive type of cancer. Cytology – Cytology refers to the examination and studying of cells (cyto means cell). These cells are usually obtained through a fine needle aspirate, where the vet will stick a small needled attached to a syringe into the tumour or suspicious area, and squirt the content onto a glass slide, which is then examined under a microscope. Many general practitioners are competent enough to make a diagnosis there and then, however in certain cases where the diagnosis may not be simple and straight forward, your vet will send the slide off to a specialist who will then examine and come back to your vet with a diagnosis. Cells for cytology may also be obtained through scrapes, cytobrushes (a small specialised brush which picks up the cells, when rolled over it), swabs or impression smears where is slide is dabbed onto the affected area and fixed and stained with special chemicals to assist in the preservation and diagnosis. Histopathology - Histopathology refers to the microscopic examination of tissue to look for disease (Histo is derived from the Greek word for tissue, and pathology from pathos which means suffering from disease). The vet can obtain tissue samples for histopathology in various ways but the most common is a biopsy, which is the surgical removal of some tissue (either a small part of, or alternatively the whole cancer) and sending it to a pathology laboratory where the sample is specially prepared and looked at by a specialist pathologist vet, who will then assist in making the diagnosis. A local or general anaesthetic is usually required to do a biopsy and is in most cases considered to be the definitive diagnosis for cancer. Even though a vet may have a very strong suspicion of the type of cancer (like squamous cell carcinoma’s of the tips of the ears in white cats), he or she may still send the tissue removed off for histopathology, after the cancer has been removed to confirm the diagnosis and/or to establish whether a sufficient border of healthy tissue is found around the cancer which indicates that full and proper surgical removal occurred. Imaging technology – Imaging technology like X-rays, Ultrasound, computer assisted tomography (CAT scans), nuclear medicine, positron emission tomography (PET scans) and magnetic resonance imaging (MRS scans) are employed to assist in the diagnosis of cancer. (PET and CAT scans sound very appropriate for animals, but as the unabbreviated names indicate, have nothing to do with animals). The imaging technology does not only assist in visualising the cancer, but in many cases play a vital role in establishing the extent and invasiveness of the cancer. 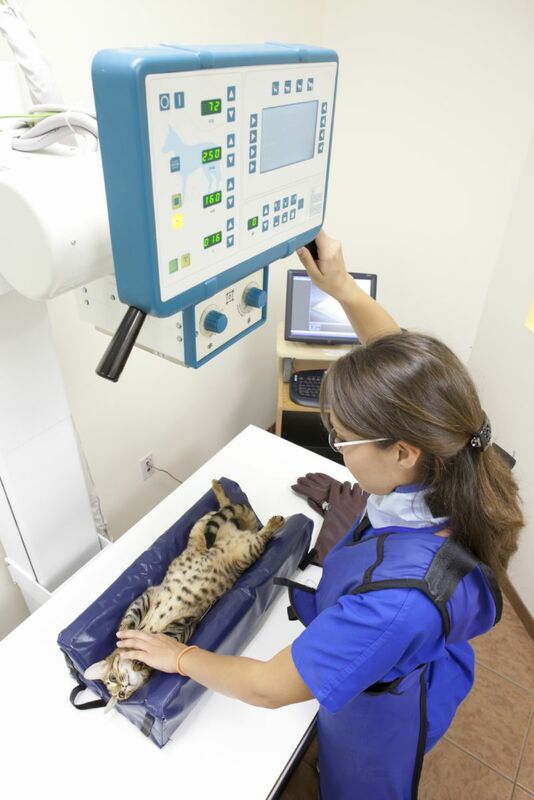 Most veterinary practices have X- ray or ultrasound equipment but the other modalities mentioned are very expensive, and are usually only found at referral hospitals or academic training institutions. No cancer or growth should ever be considered not to be serious. Rather let the vet do a thorough investigation and diagnosis, and establish a prognosis and treatment plan for your pet as soon as you notice any lump or bump or change in the behaviour of your pet.